Currently on display at Pratt Fine Arts Center, Seattle. It is available to purchase but may take an extra day or two to ship. 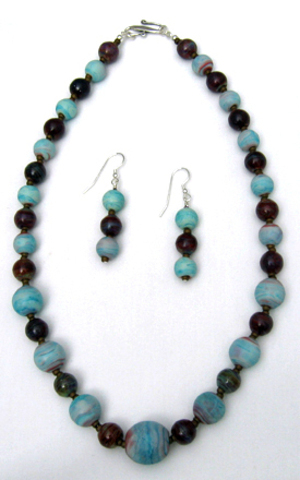 This necklace/earring set features forty-one lampwork beads. Except for the complementary seed beads used for spacing, every bead was handmade one at a time on my torch at the Pratt Fine Arts Center. For half of the beads I used copper green glass (which was then etched to a soft matte finish bringing out striations of reds and blues and greens). The rest of the beads were made with a silver glass that produces rich red and green tones as the oxygen/propane mix of the torch flame is manipulated. The clasp and earrings are sterling silver.